Very demanding two weeks have come to an end. It has been a time of running from one airport to another and crisscross Europe in a couple of days intervals. It has been the most rewarding time with two major conferences – both in their own way magnificient – this week. The week has also seen more exciting events with me joining those people who leave their laptop in a taxi. Luckily, my hotel in Rome had booked the taxi to the airport, so the company they normally use could track down the driver and I got my laptop back in time for my flight. In addition, the already late aircraft was stopped in the runway due to a brief thunderstorm and hale shower. Unfortunately, the aircraft was hit by lightning, so we were forced to return to the terminal for a check-up. An hour or so later we finally made our way to the skies. I arrived home at 11pm – only to leave for a train to Cambridge 7.25am. But I made breakfast to my son before leaving! I was in Rome in the Migration and the Mediterranean conference, where a multidisciplinary group of scholars discussed the migration across the Mediterranean in the past and present. 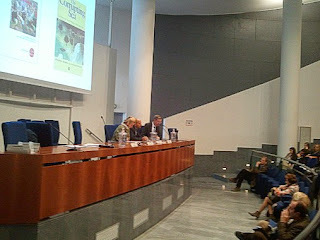 The event was organised in co-operation by the University of Rome Tre, Lund University, the Swedish Institute in Rome and USI network (Universities and Swedish Institutes). This is an example of the kind of events the Swedish Institutes host these days. Collaborative, international and bridging the past and modern times. Together with the USI network the institutes in Rome, Athens and Istanbul organise MA-level university courses that have a residential part in the Mediterranean and that are frequented by students from all over Sweden. This time – during the week when the Mare Nostrum rescue operation in Italy came to an end and was replaced by the EU border control programme Frontex – much of the attention was concentrated on the North African migration to Europe and asylum situation in relation to the war in Syria. Many of these asylum-seekers try to enter Europe via Tunisia or Libya and Lampedusa is their point of contact with European officials. Almost a half of the researchers were jurists discussing the migration flows from North Africa, international sea rescue laws and marine principles, the definition of minors in the asylum process and the principle of solidarity and Dublin convention in the European Union. The director of the Swedish Institute in Rome, Kristian Göransson, talked about the early migrations of major civilisations across the Mediterranean and I presented my case study from Nepi discussing Latin colonisation as migration. My argument needs definitely more work and I overrun and had to cut my talk short, since one has to explain more to non-archaeologist audience, but I could give an inkling how a local archaeological study can have implications to regional and even global issues. I also asked people to sign the Save the Mediterranean Institutes petition. This week saw the Swedish newspaper articles that seem to confirm that the source of the financial cut plans in regard to the Mediterranean Institutes came from the Swedish Treasury. There was also a suggestion that these plans were drawn a significant time ago and were now presented suddenly in the budget framework. Another development is that the Higher Education Minister has been asked to face the Culture committee of the Swedish Parliament in order to answer the questions about the preparations of the budget framework item(s) and if the concerned parties and stakeholders were consulted as required by the Swedish law. Apparently the law states that if the cuts have consequences in the functioning of the organisations in question, these have a right to make their case BEFORE the plans are made public. The hearing will take place on November 18 and it will definitely make interesting hearing and reading. It was confirmed in the papers that the head of the governing body of the Institutes was phoned on October 22 – a day before the plans were made public on October 23. The procedure may have been incorrect. This makes the collection of names to the petition important, since it will show the government the support, contacts and collaborations the Institutes have nationally and internationally. The opening panel in the Migration conference saw the current Swedish ambassador in Italy speaking about the ancient civilisations and their migrations and influence in the Mediterranean and over our culture in her talk. 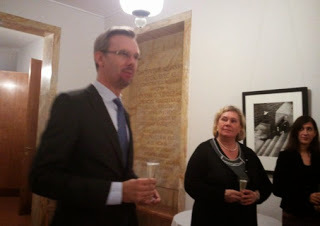 The current Italian ambassador in Sweden talked about the urgency of the migration issues in Italy and Europe and the need for co-operation. In their diplomatic and tacit ways they supported the Institute and USI in these unexpectedly turbulent times. 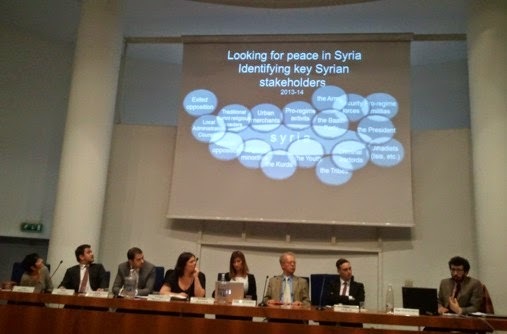 The conference was finished with a panel on the Syrian issue of more grass-root experts ranging from a Syrian refugee, Syrian researcher living in Sweden, Italian journalist based in Beirut and specialising in Syria and advising different public bodies and different NGOs helping Syrian refugees in Turkey and France. They had concrete suggestions how the situation could be eased or even slowly solved, but they saw a few years of war ahead of us. Some of the suggestions were such that one would have hoped that the representatives of Italian government and European Union had been present. It made a lot of sense, but the whole panel reminded everyone in the audience how much Turkey is bearing of the refugee support and how small numbers of refugees are taken officially by different European Union countries. Sweden is there among the two biggest helpers, but sadly my homeland is sticking to its traditional hundreds and my adopted homeland is not pulling its international weight. The conference finished with a delightful concert of the Mare Nostrum ensemble, a special event organised by Roma Tre in the honour of the conference. 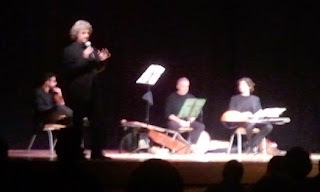 The ensemble played Renaissance and Baroque themes that had travelled Europe-wide and influenced Bach and other great composers in order to bring a pan-European message to Rome. The lovely evening with music and song finished with a Neapoletanean version of Santa Lucia – originally a local boat song. It lightened the atmosphere after the serious discussions on Mare Nostrum, Frontex and Syria. With the openings of potential new lines of co-operations between archaeologists and lawyers, we live exciting times – and not just worrying ones.